PROCESS : This is like injection molding, except there is no mold. Molten plastic is forced or extruded directly out of the barrel through a die horizontally to form a continuous, long line of plastic. It goes through a trough of cool water for hardening and is then cut to length. Toothpaste tubes and cookie presses are examples of simple extruders. 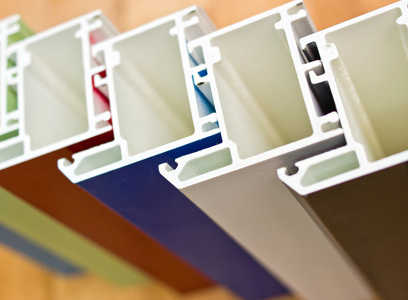 Sheet extrusion is a variation of this process where continuous sheets of plastic are extruded in various widths for vacuum forming and other secondary processing. RAW MATERIALS : Most commonly extruded material is PVC, although most plastic resins can be processed. Melt index (viscosity) must be fairly high. The resin is in the form of pellets before processing. TOOLING : Steel dies are typically made by a wire EDM process. Some “downstream” tooling may be necessary to ensure shape of profile. COST : Dies and parts are relatively inexpensive. ADVANTAGES : Equipment widely available in all geographical areas. Short lead times. DISADVANTAGES : Design possibilities severely limited because of linear nature of process. EXAMPLES : Vinyl window parts, building products including baseboard, straws, tubing of all kinds & handles.